Entering the final round, both tournaments had one clear leader as well as one or more players trailing by half point. The tournaments were reaching their crowning moment, the players’ nerves were at their peak, and the tension could be felt in the air. Caruana had the “easier” job on paper. He was half point ahead of the field and was playing the lowest seed and the player standing at the bottom of the standings list. In the rearview mirror it was Nakamura and So who had to give their all in order to catch Caruana at the top and force the playoffs. But this was no fairytale. 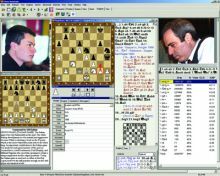 Caruana knew how big of a favorite he is in his match against Chandra and he was ready to pull the trigger and run home with his first U.S. Championship title. The games started slow with Caruana playing his pet Ruy Lopez as Black, Wesley playing an unusual line of the English opening, and Nakamura being the only one with almost no chance at winning his game as he entered a dull line of the 5.Re1 Berlin. It wasn’t long until Nakamura threw the towel and drew his game against Robson. He was now 99% out of the title contention and he agreed that this final game was not the reason for his title slip up. 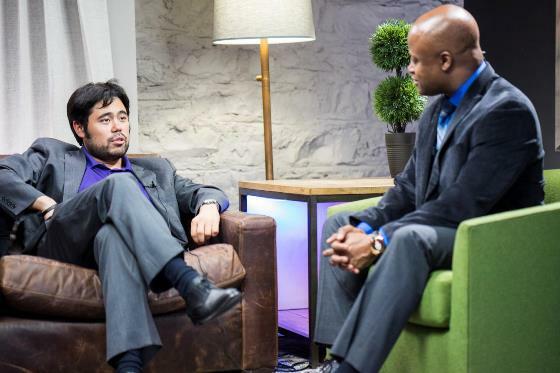 He blamed his inability to beat Chandra and his Hara-kiri game against Caruana. Wesley, on the other hand, was pressing. He knew the opening better and obtained a marginally better endgame. Black was a pawn up in that game but had to face the constant pressure of the bishop pair, as well as the ongoing ideas of giving one of the bishop for the knight and entering a bishop of opposite color endgame. One thing that Wesley is known for in the chess world is his Carlsenesque ability to grind down his opponents, especially the lower rated ones, in positions with minimal advantage. 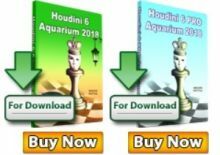 With accurate technique, he managed to get his opponent to the breaking point and could have gotten an almost decisive advantage if he would have spotted the tricky 45…Bd5! Locking the opponent’s bishop on h7 and allowing his passed pawn to have a clearer path to promotion. Instead, he allowed the bishop to find freedom on f7. From there on Lenderman’s resilient nature did not crack and the two split the point at move 72. Caruana was closely studying his rivals’ games throughout the round, and was surely quite relieved when Nakamura drew and Wesley spoiled his chance. A draw and he would be crowned as the new U.S. Champion! 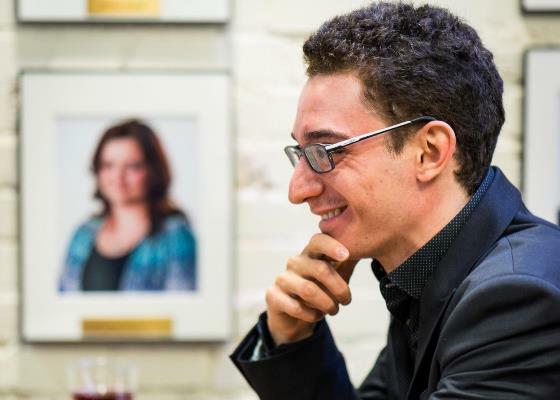 But he is Caruana, the #2 player in the world and one of the most ambitious young players this planet has to offer. He wanted to win his first American title in style, and he pressed! With every move the pressure was increasing on young Chandra, and at move 29 he mistakenly offered the Bishop exchange with 29.Bc4?! This allowed Caruana to grab the initiative and from there on it was all downhill for the young Chandra. 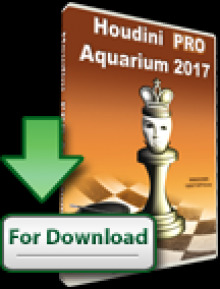 Fabiano improved his pieces with every move and annihilated every counterplay that his opponent could use towards his escape. At move 53, the new American champion was crowned! The Women’s Championship followed a much more dramatic scenario. Going into the last rounds, Tatev was half a point ahead on the standings and was playing the much lower Eswaran. 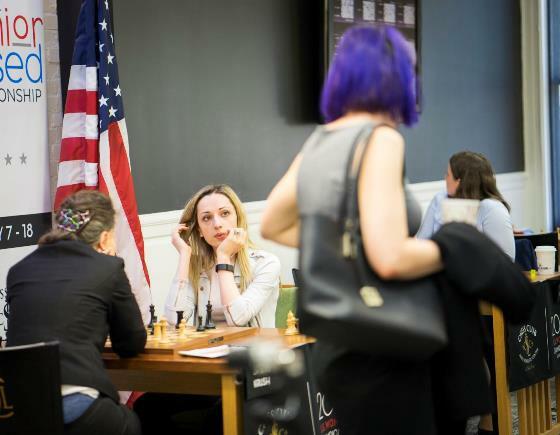 On the other side, Paikidze was trailing and had to play against the defending, and most dominant champion in U.S. Women’s Championship history, Irina Krush. Looking back at the final result, one would argue that Tatev’s opening choice was far from inspired. But this can always be said after everything’s said and done, and not that easy to conclude before the results come in. She chose to face Eswaran’s 1.e4 with the Najdorf Sicilian—not her usual choice as she is a fearsome French player. She later explained in her press conference that she did not want to fall into her opponent’s preparation and therefore decided to choose muddier waters. Unfortunately for her, Eswaran was extremely well prepared and played an almost perfect game to throw Tatev’s title chance into the abyss. It was a painful sight to see as Tatev has been on this side of the story before when she lost her final tiebreaks against Krush in 2014. 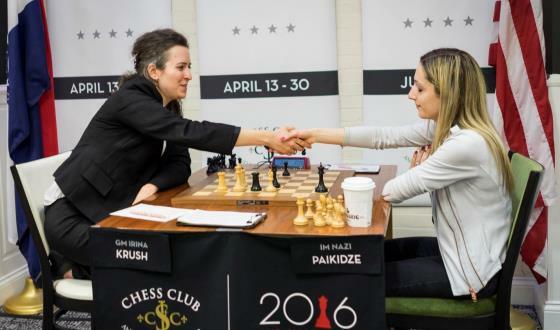 All she could do now is wait for Paikidze’s game to conclude, and the odds were not in her favor as her rival had an overwhelming position against Krush. It must have been the most difficult waiting hour for Tatev, as she had to watch Nazi going from completely winning, to slightly better, to almost winning again and accept the fact that she cannot do anything about it. In the end Nazi won her game and becomes the 2016 U.S. Women’s Champion! What an achievement for a women that is only at her 2nd participation in this prestigious event! We are surely experiencing a change of guard, and if we can’t really count Krush and Zatonskih out of future title races, it becomes clear that Abrahamyan and Paikidze have the hunger and motivation to continue pursuing gold in future years.